Hi Guys - I just had to send an email because I am sooooo impressed with the service and quality of your product! professionally packaged, within 10 days and looks fantastic on my Taylor - best of all...what I saw on my laptop 10 days ago is exactly what arrived in the post - only it looks even better up close. I'm glad you liked it and I would like to say thank you so much. Rosetta(Purf Ring) fits perfectly with Taylor. It will be a real pleasure for me to deal with you. 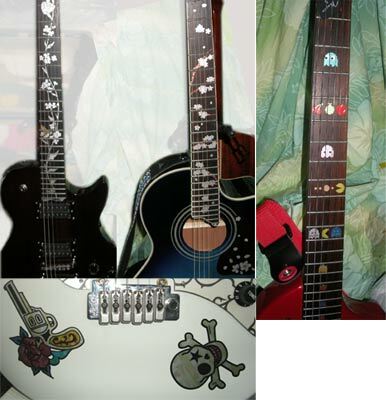 I've bought stickers for my tenor ukulele. I give you 2 pics for your collection. 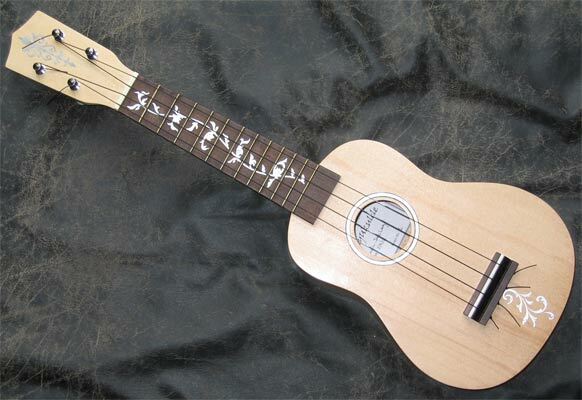 This tenor uke is BOULDER CREEK, isn't it? 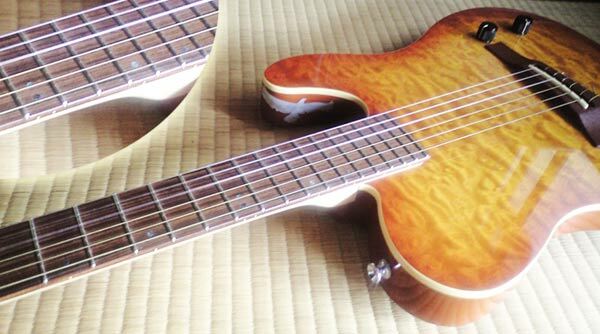 It has characteristic of a portion of the side holes. This ukulele is good, I love it! It looks good in "Ai" "Tree Of Life""Traditional"
It is our web-store to appear in the monitor! I am pleased to report that the sticker arrived this week. Here is a photo of it in place. I am very happy thankyou. Thank you for sending a pictures. 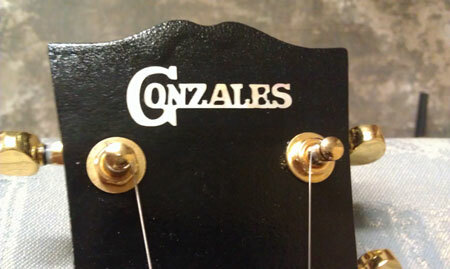 This Headstock inlay sticker was made with Custom Order. Your stickers had arrived this morning, thanks. As the last times it was a pleasure to work with them you do a good job. 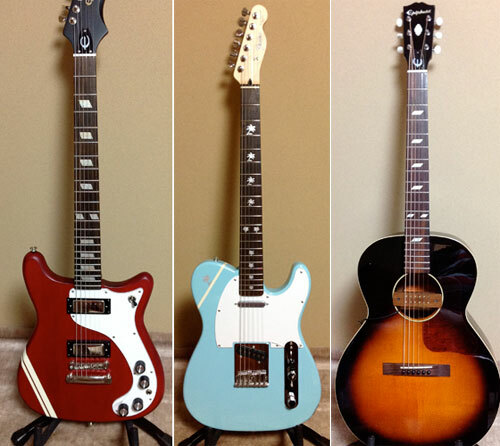 I include pictures of 3 instruments at which i used your stuff in the last month. 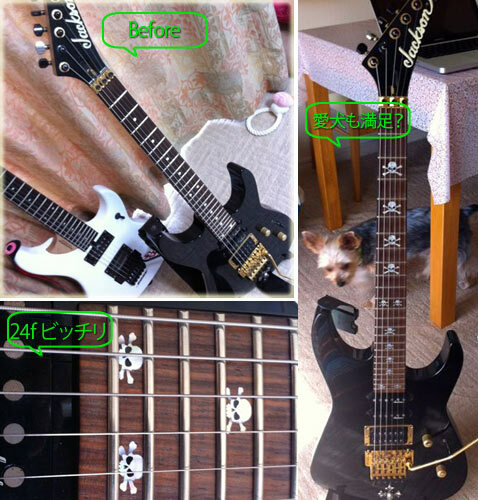 I bought this cheap beginner guitar with 3 others as b-ware with loose screws at the tuners. 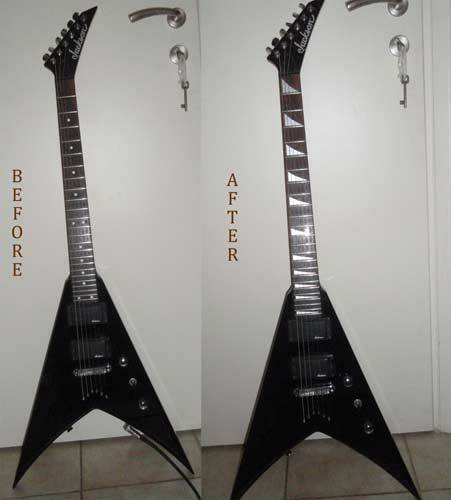 After replacing the screws with bigger diameters and cleaning it, we decide to sell it. 10 minutes later, a plier slipped through my fingers and - thanks to Murphys laws - hitted the guitars front with the sharp edge, breaking a small dot out of the colour. So i used some decals to cover the damage and give her a unique look. 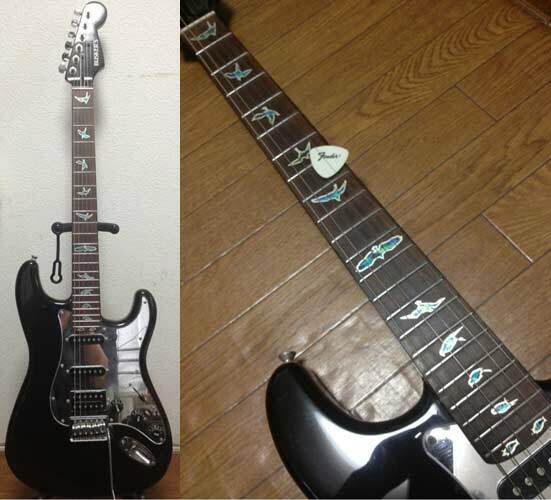 The guitar is allready sold now. 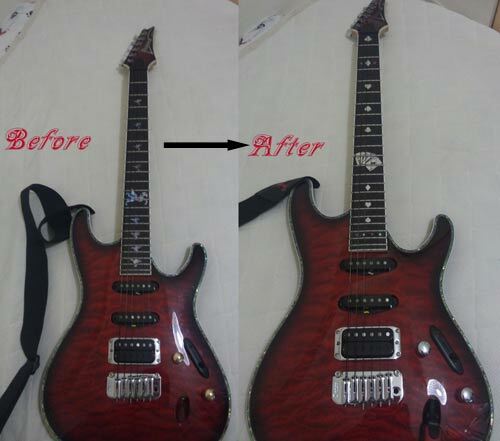 I bought this cheap beginner guitar with 3 others as b-ware with a missing left tuner. 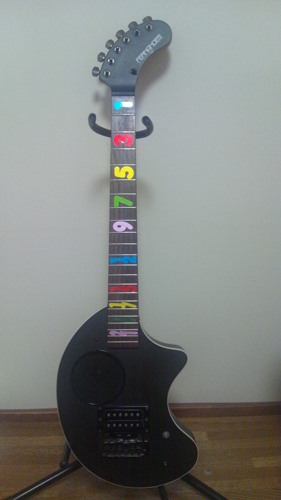 After replacing the tuner and tuning the guitar we decided to use it as a "familiy" guitar. 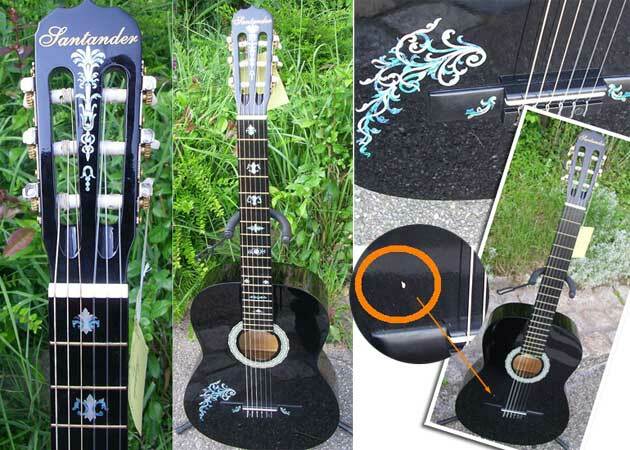 So i used blue abalone style dot fret markers for this guitar. 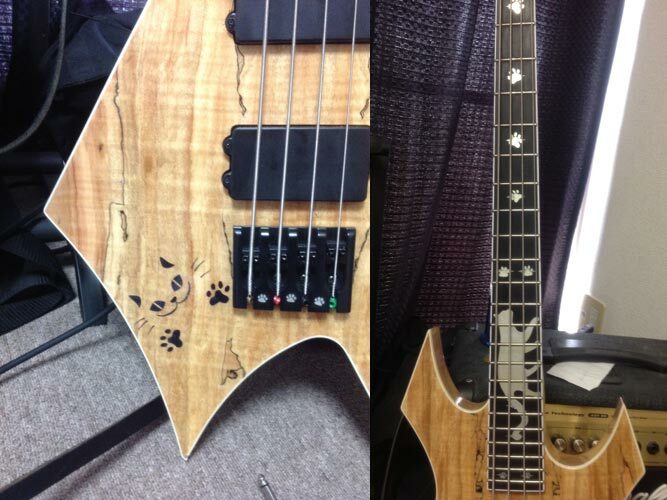 This was an 8-stringed Bass from korean manufacturer "Wolf". 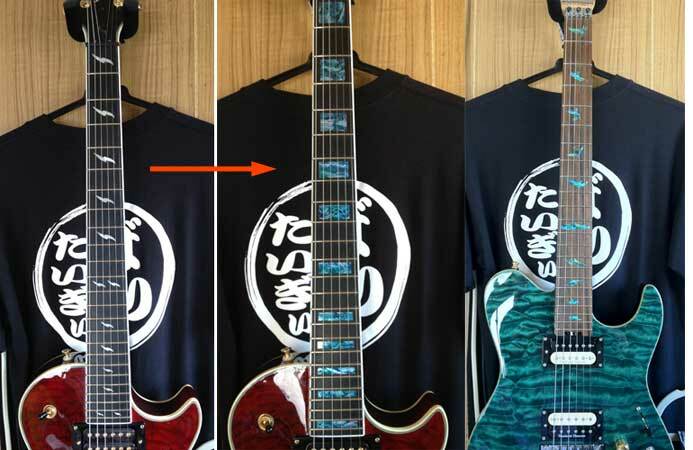 As a beginner i couldn't handle the additional Octav-strings, but i "felt in love" with this green-golden beauty, so i converted "her" to a 5-stringed one - look at the unconventional D-string tuner at the headstock. 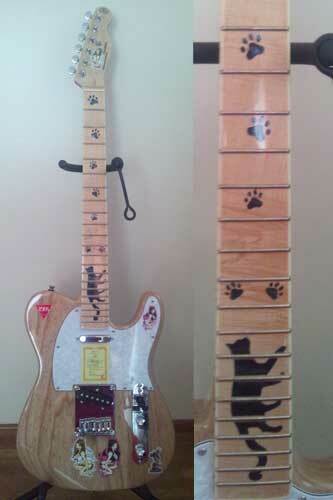 With the original bridge, saddle and the other 3 tuners i can re-convert her to an 8-String every time. Trying optical "fine-tuning", i wanted to replace the white plastic fret markers with green or ocker ones from Jockomo, but from the pictures at the webshop my fantasy couldn't choose which colour matches more with the green and gold tones of the bass. So i ordered both. 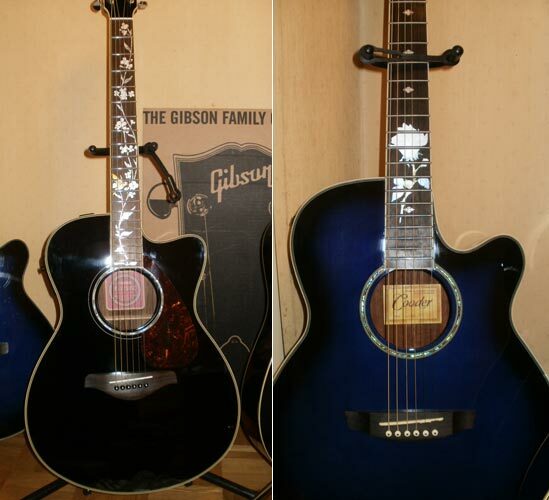 After arriving i still couldn't choose the colour, so i used both colours alternating at the fretboard. Maybe in some time i will use just one colour - i have enough dots in stock yet. 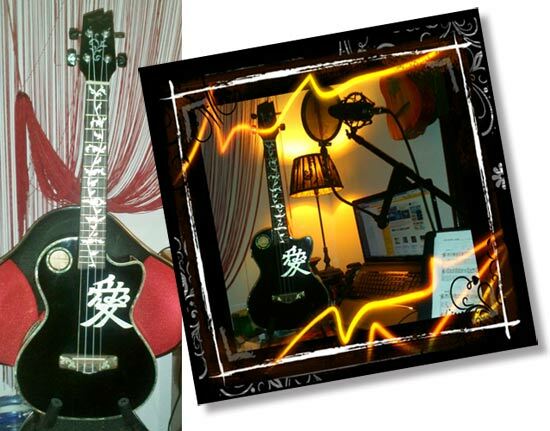 He uses our product to a guitar effectively. 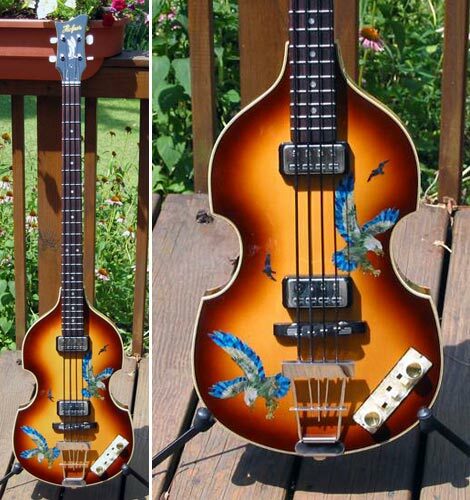 This ukulele is handmade, isn't it? 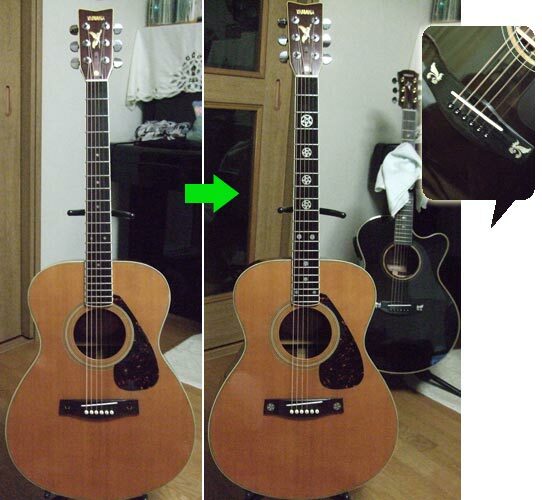 I can see a date and a signature on the label in the sound hole. I am glad that my product is used for the ukulele. 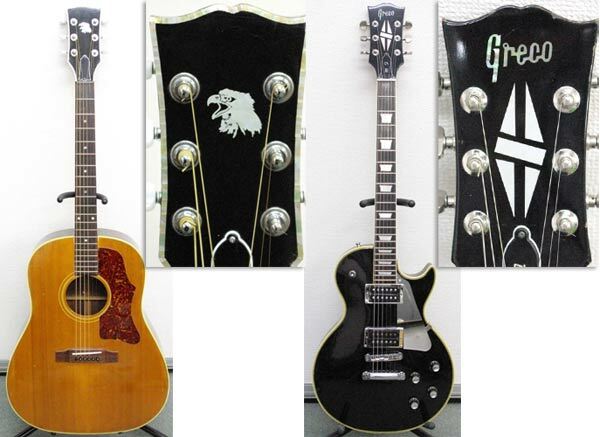 HIGHLY RECOMENDED SELLER AT EBAY!!!!! 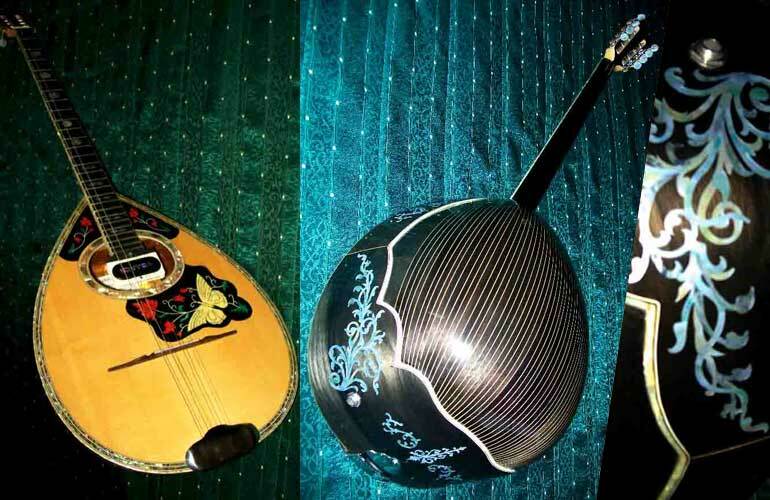 The bouzouki was made from "ΚΩΝΣΤΑΝΤΙΝΟΥ" a professional luthier from Larissa in Greece. 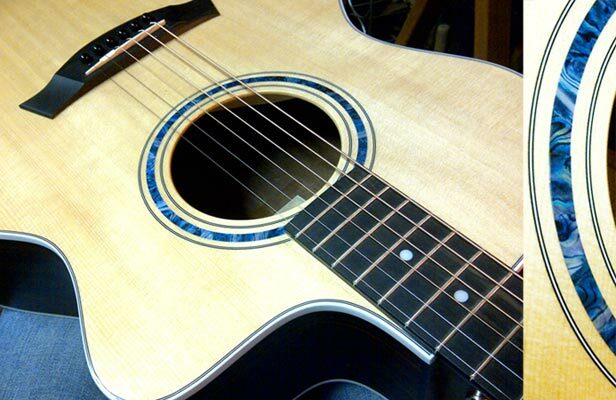 I love the sounds of bouzouki, Its tone heals the mind. 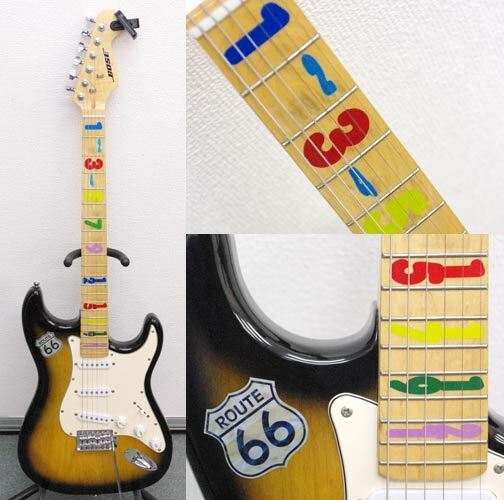 Thank you for sending picture.This fret markers was made with Custom Order. "The girls in Block" It is so cool!!!!! Fitting perfectly into the Ibanez SA 160. Hope to deal with you again! The stickers arrived today and they are exactly as I wanted. Very big thank you to you. Next time I need inlaystickers I will contact you. And when my friends want to know where I got these, I will tell them your website address. This item was made as "Custom Order". 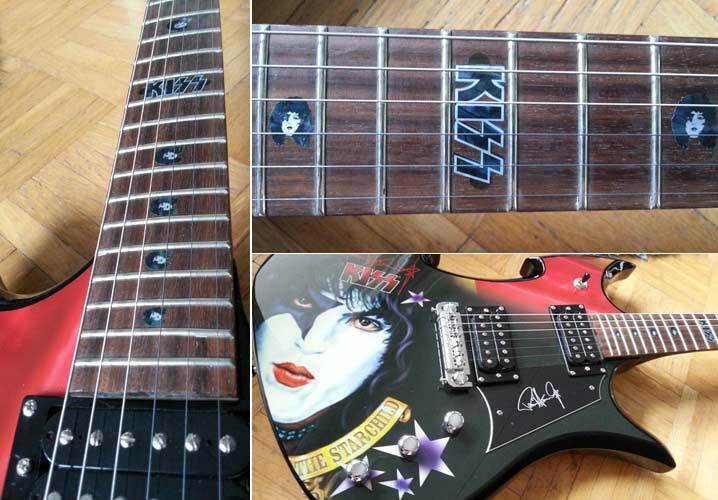 The fret markers are face of Paul Stanley of KISS. 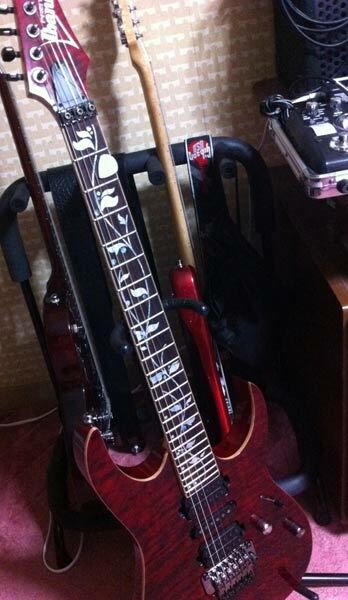 And logo of KISS in 12th fret. 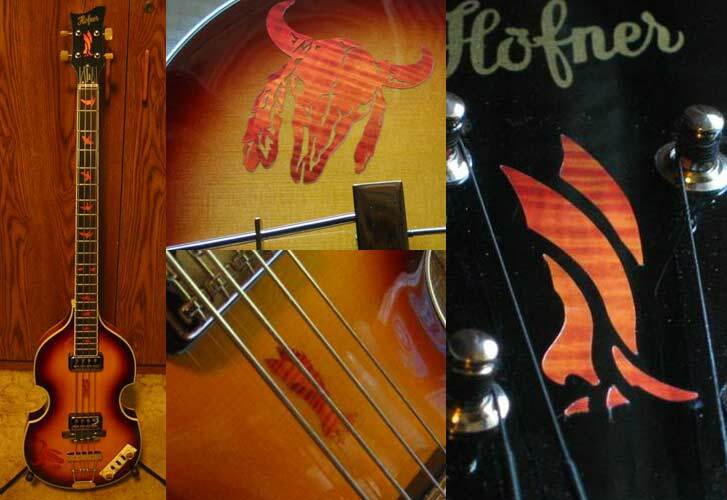 Jockomo…Here are the latest of your fantastic Inlay stickers for my Hofner HCT bass. I love this effect. 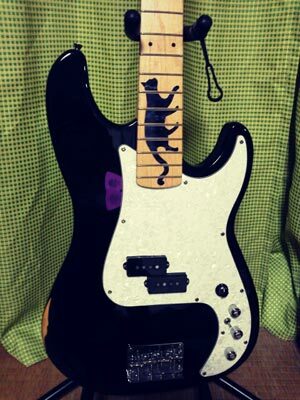 Your inlays are the best!!! I took a deep breath of admiration. I'm very very happy to hear such a compliments. I just received the stickers and they look great on my King-V! 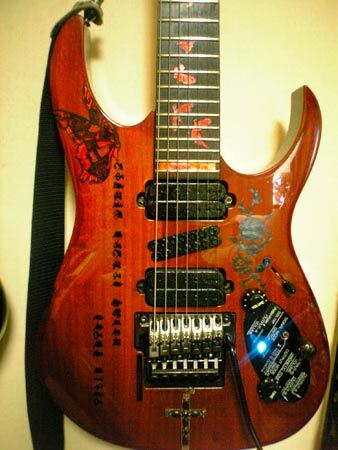 Jackson JS30KV KING V seem like a Rohads Model. I hope to deal with you again! Thank you for sending additional pictures!